Part of the string of coral keys known as the Jardines Del Rey - the Garden of Kings - Cayo Coco and neighbouring Cayo Guillermo offer sun-drenched beaches, quality hotels and a relaxing environment that's perfect for recharging your batteries. On the same stretch of coastline, Cayo Santa Maria and Cayo Ensenachos are quieter alternatives, while on the Caribbean side, Cayo Largo is renowned for stunning beaches. 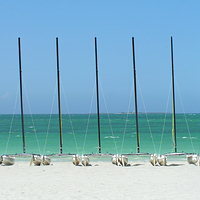 This is a great place to get away from every day life - so don't come expecting culture and traditional Cuban life! The islands boast a rich natural habitat and are home to a variety of bird life, including flamingos and pelicans. Cayo Coco itself has over 15 miles of beautiful beach - just part of the reason why these islands are so perfect for relaxing. Nearby Cayo Santa Maria is a real hideaway just waiting to be discovered - a protected biosphere reserve and home to flamingoes, pelicans and other birdlife, Cayo Santa Maria is linked to the mainland by causeway. Cayo Largo is located off Cuba's south coast, in the Caribbean, around a 40 minute flight from Havana. Only 15 miles in length, the island is home to endless white sand beaches and offers great opportunity for activities and relaxation alike. Most hotels on the islands operate on an All Inclusive basis. Hotels that offer this will include most meals, snacks and drinks in the cost of your holiday, with many sports and activities also included. Exact details vary from hotel to hotel, so check with us first. Spend a week or two relaxing on Cayo Coco, Cayo Guillermo or Cayo Santa Maria, or combine them with a few nights in Havana. With this option, it's normally necessary to spend at least a night in Havana at the start and end of your holiday. Cayo Largo is a little harder to reach, and is best twinned with Havana. 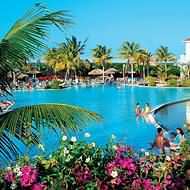 Holidays are based on flights from Gatwick to Havana on a scheduled airline and transfer from there to Cayo Coco, Cayo Santa Maria or Cayo Largo on a short domestic flight. See Havana for details of flights. Return to the UK via Havana, with a night spent in Havana at the start and end of the holiday. Most holiday durations are possible. There are also direct flights to Cayo Coco and Cayo Santa Maria from around the UK, with most flight options being from Gatwick and Manchester. 7 or 14 night holidays are available. 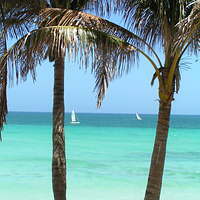 Have a look at our range of hotels in this part of Cuba. If you see something of interest call one of our friendly reservations staff on 020 8989 0970, or fill in a quote and we'll check availability and get back to you. If you're not sure what's best for you, ask to speak to one of our staff for ideas and inspiration.